As the weather is getting warmer, I’m reaching for heavy foundations less and less. Back in March, I finally bought the Bare Minerals Complexion Rescue Tinted Hydrating Gel Cream after months of lusting after it. 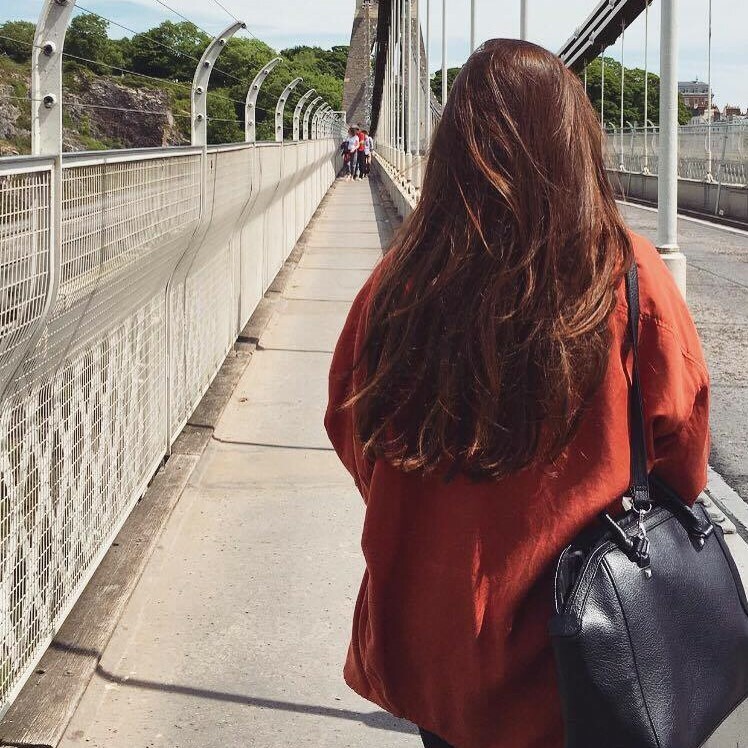 I’ve been using it on and off ever since, so today, I’ve rounded up my thoughts to share with you. 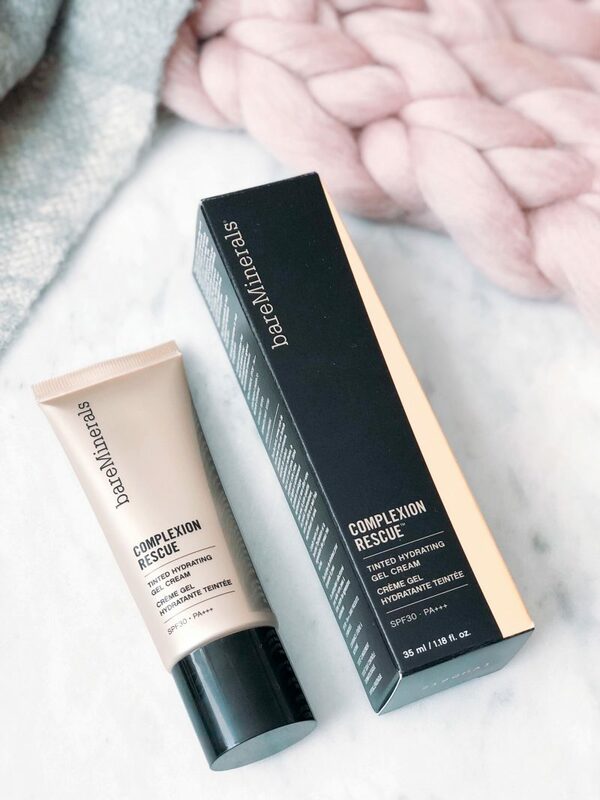 If you haven’t heard of it before, the easiest way to explain the Bare Minerals Complexion Rescue is as a tinted moisturier. The gel cream is marketed as a product that takes the best of both from BB (beauty balm) and CC (colour/complextion correcting) creams. With 16 shades (I have the colour Buttercream), the coverage is claimed to be ‘sheer to medium’. The cream is £28 for 35ml and boasts SPF 30 PA +++. Bare Minerals place focus on the skincare benefits, such as the marine botanicals, mineral electrolytes and water encapsulation for an instant burst of hyrdation. With the basics out of the way, let’s start with the shade range. There are a good choice of colours, with 16 shades in a mix of warm, cool and neutral undertones. I chose the shade 03, Buttercream. This shade is described as being suitable for ‘light skin with gold undertones’. It is an ideal match for my skin once I have some colour in summer (about MAC NC20 for reference) so thumbs up for the shade for me! Now lets talk coverage. I’m going to stick with saying that this provides sheer coverage, that can be layered a little. However, it is never going to be a fuller coverage product; it simply isn’t designed to be. If you like to cover your skin, this won’t be your cup of tea. If you are happy with your natural complexion shining through a little and a lighter base though, I think you will be a big fan. 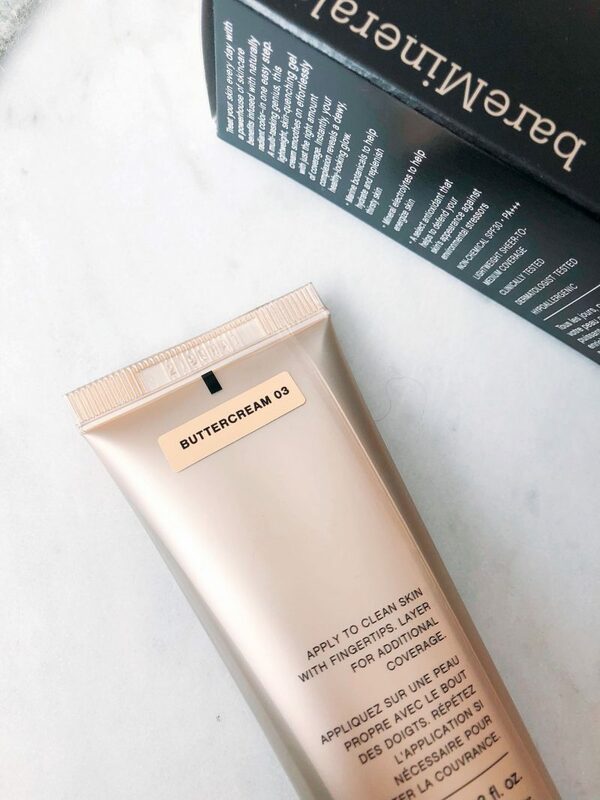 In terms of application, I’ve found my favourite way is to apply with my hands, although a Smoothing Face Brush is also available as the recommended applicator. Personally, I like to really blend in lighter-coverage products with my hands – I think the warm of your hands really helps it melt into the skin for the most natural finish. I wouldn’t recommend that you use a sponge with this one – it will soak up lots of product meaning more waste. So how does it look on the skin? It is a beautiful, smooth formula that glides on, providing a natural, sheer, pretty coverage. The gel cream knocks back redness and evens out the complexion. It isn’t going to hide any spots, but that’s what concealer is there for! My skin is dry, and this provides a very welcome boost of moisure. Some tinted-moisturiser products aren’t very hydrating, but the Bare Minerals Complexion Rescue is. My favourite way to use this product has been to apply a pea-sized amount to my skin before running out of the door to hide redness and brighten my face. I actually like using it without any other makeup for a really natural, fresh face. I have to be honest though, I’m not reaching for it every single day. As much as I love it, I seem to be the kind of girl who wears nothing at all, or a foundation. If I’m not going for full coverage, I like letting my skin breathe. Since discovering the Tan Luxe Illuminating Tanning drops which I mentioned in this Cult Beauty Haul, I haven’t really been wearing any base at all! I think the bottom line is that if you are someone who likes a fresher face, there are literally no downsides to the Bare Minerals Complexion Rescue. It has a lovely coverage, good shade range and feels like skincare. I really can’t fault it. For those of you who like a fuller coverage, I’d probably avoid as I’m not sure you’ll get the wear out of it. A perfect day-to-day base for anyone who just wants to give their complexion a little boost! Do you think you’ll give this one a try?